Whether life exists beyond Earth has been a long-standing question in both science and literature, but it wasn't until the past 50 years or so that humans began to pursue the answer vigorously. Because some radio signals can only be generated artificially, radio telescopes are some of the most used instruments in the hunt. In July 2015, the Breakthrough Prize Foundation launched the most comprehensive astronomical search for intelligent life ever undertaken, committing to spend $100 million over the next decade on this effort. The project, known as Breakthrough Listen, partnered with the Green Bank Telescope in West Virginia, the Parkes Observatory in Australia and the Lick Observatory in California. The instruments at Parkes and Green Bank will perform dedicated searches for radio signals, whereas the Lick Observatory will hunt along optical wavelengths. Although it's not part of Breakthrough Listen, the Arecibo Observatory, located in Puerto Rico, has spent a significant amount of time over the past half century looking for extraterrestrial life. Rather than using dedicated time to search for signals, the search frequently piggybacks on other scientific searches, scanning whatever part of the sky has been allotted to other researchers. Now, the world's largest single-dish radio telescope has joined the hunt. 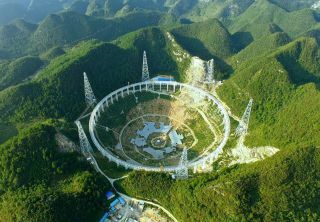 The Five-hundred-meter Aperture Spherical Telescope (FAST), located in China's Guizhou province, has teamed up with Breakthrough Listen to hunt for signals from space, sealing the deal at a signing ceremony in Beijing. The enormous instrument saw first light only a few weeks ago, on Sept. 25, 2016. Together, the organizations will exchange observing plans, search methods, and data, as well as host a series of meetings and conferences to improve their methods. Jun Yan, director general of NAOC, said that, as the world's largest single instrument, FAST "will be one of the most powerful instruments to search for the potential intelligent life beyond Earth." According toan online report comparing the two by Robert Williams, a mechanical engineer at Ohio University, the enormous instrument is more sensitive than the smaller Arecibo dish.The iconic dish, once the largest single instrument, is dwarfed by the Chinese telescope, which Williams says is almost twice its diameter. Made up of 4,450 panels, FAST is the size of 30 football fields, China’s state-run Xinhua news agencyreportedearlier this year. Although arrays of multiple telescopes can grow larger, the new instrument is the largest single-aperture telescope in the world, and should be able to detect signals from farther out than Arecibo can, Williams said. "The FAST telescope is a remarkable instrument with unprecedented power," said Pete Worden, executive director of the Breakthrough Initiatives program. "We are delighted to be collaborating with NAOC." Follow Nola Taylor Redd on Twitter @NolaTRedd, Facebook, or Google+. Follow us at @Spacedotcom, Facebookor Google+. Originally published on Space.com.